In addition to measuring the amount of power generation during weather changes, temperature changes, and other criteria, we perform verification tests on OTEC technology and ensure stable output. In order to develop practical uses of ocean thermal power generation facilities in the future, and reduce the cost of power generation, we are considering the installation of offshore type OTEC plants. 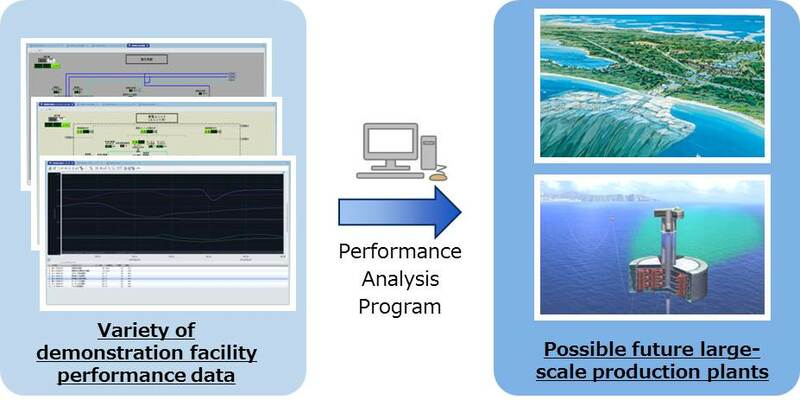 We investigate and examine the potential use of deep-ocean water after use in ocean thermal power generation. The Kume Island OTEC facility is the next step in Japan's proof-of-concept for models and designs developed at Saga University's Institute of Ocean Energy. The plant allows operators to validate computer models and gather data under many real world conditions. The 100kw class facility will pave the way for future projects such as a 1MW onshore or 10MW offshore facility.